I could eat dosas (Indian pancakes made with a variety of rice and lentils) practically everyday! And I do! Although we do eat a wide variety of dishes for breakfast, more often than not, it is dosa that gives us the nourishment to begin the day. Regular south Indian dosa made with urad dal and rice-made with many twists and variations, Tamil style adai made with different kinds of lentils and rice, set dosa, Andhra style pesarattu and many other styles of dosa make a regular appearance on our table. 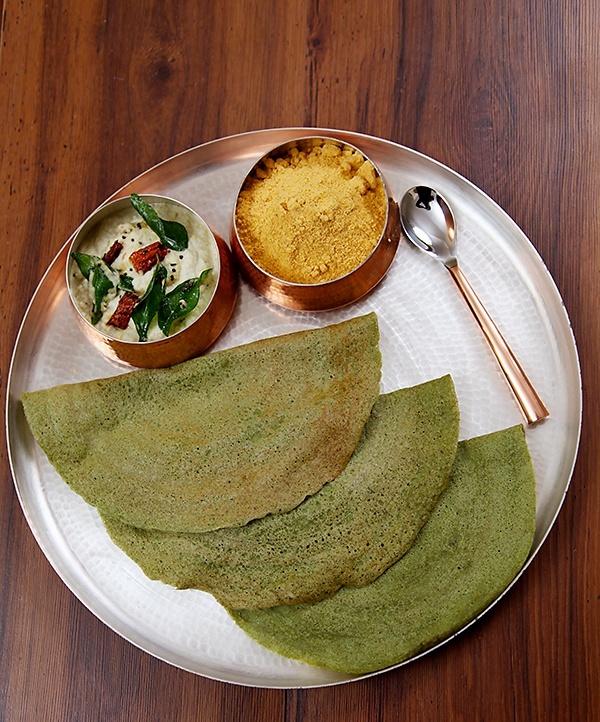 The dosa in the spotlight today is the Andhra Pesarattu, made with one of my most favourite ingredients to cook with, the mung dal. 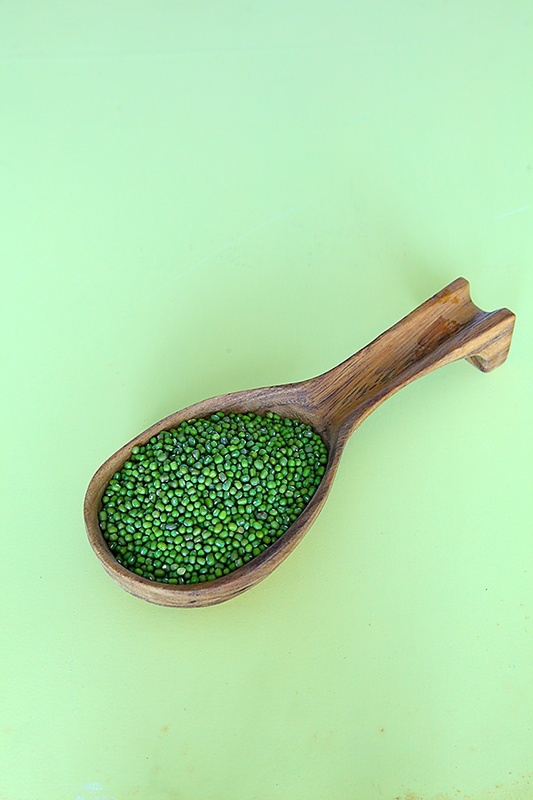 The mung dal or moong dal is used whole, split and also without skin (yellow moong dal) and I usually have a stock of all the different forms of this dal. Ayurveda holds this dal in great esteem and it falls under the special category of food which is good for all types of physical constitutions (namely the vata (air), pitta (fire) and kapha (water). The pesarattu is a healthful dosa made with the wholesome and nutritious greengram dal. When ground with a little rice and made into pancakes like this and served with delicious coconut chutney, this becomes a tasty treat. I always have a stock of dry chutney powders (peanut, gram dal, coconut, etc) to go with these dosas. They are also great to sprinkle over when I make masala dosas. At times I like to eat pesarattu with a little jaggery tucked into the middle of each fold that forms a mouthful. This gives an extra dimension of taste and the sweet taste that I so desire at times. The batter can also be used to make mini pancakes and packed into kids snackboxes for a nutritious meal. Hari prefers the regular dosa that he calls white dosa and this dosa which he calls green dosa often gets neglected by him until I intervene and put in interesting accompaniments. What appeals to me about this batter is how quickly it all comes together and that there is no need for fermentation. And the fact that all the B vitamins and other nutrients in the moong dal will nourish my family apart from giving us great contentment, making this dosa one of the best forms to eat moong dal! 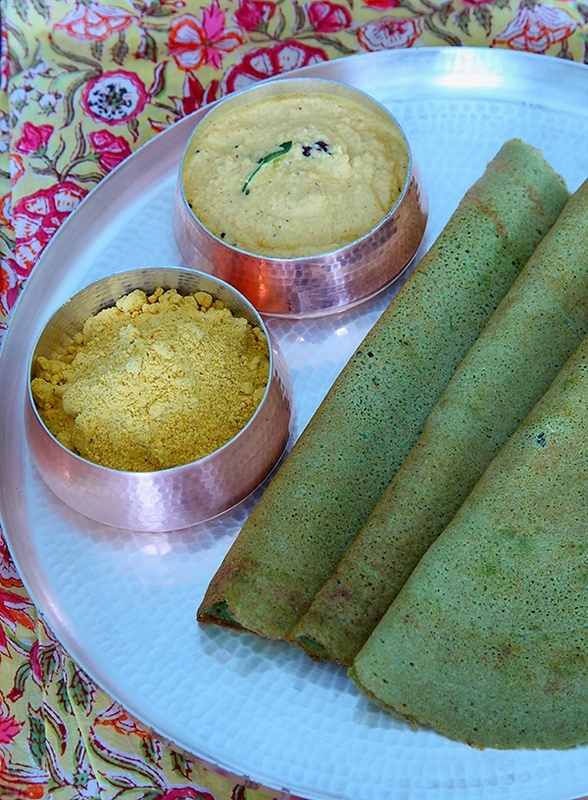 You can also use split green gram dal with skin to make these dosas. 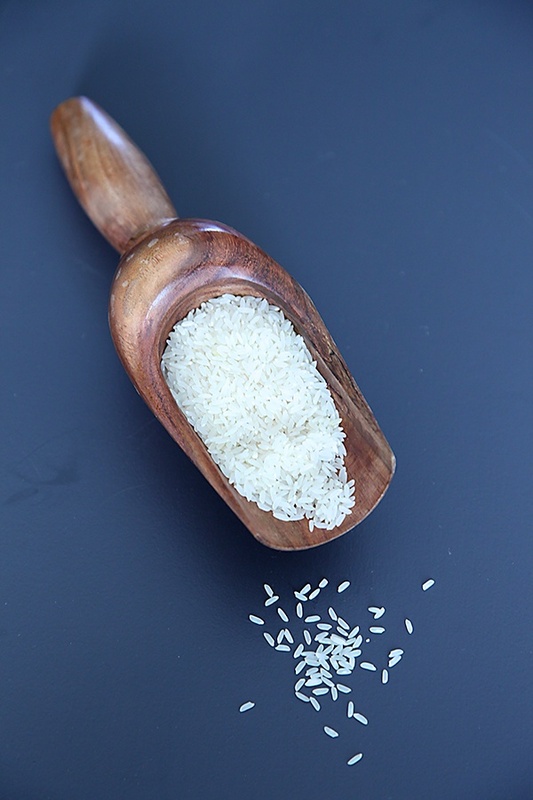 Wash and soak the dal and rice in water for 2 to 3 hours or overnight if you want to make the dosa early in the morning. Drain the dal and rice and put them in a blender along with 1 tsp ginger, 2 green chilies, ½ tsp asafetida, 2 tbsp coriander amd ¾ tsp salt. Grind to a paste, using a little water. Heat a tava or griddle and once it is hot, turn down the heat and smear it with some oil using a raw potato. This ensures that the dosa does not stick to the pan. Pour a ladle of batter in the centre of the griddle and spread it quickly into a thin large circle. 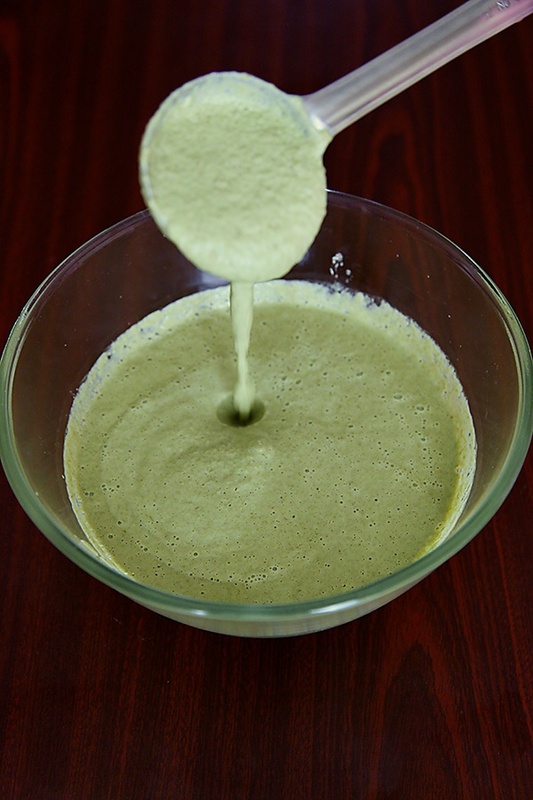 Pour a tsp of oil around the edges and cook on medium heat until the dosa is crisp and golden. Once the dosa is cooked, flip over and cook for about a minute more. Fold and serve with coconut chutney or any other chutney of your choice. You can replace the red chili powder with a green chili for a variation. In a blender or a food processor, put in all the ingredients for the chutney and blend into a smooth paste until well blended. Transfer to a bowl. In a seasoning pot or a small wok, heat the oil and once the oil is warm enough put in the mustard seeds and allow to splutter. After the mustard pops, put in the chilies, curry leaves and asafetida. Turn off the heat and pour the hot seasoning over the ground chutney. Mix well and serve. healthy, filling dosa. Perfect for breakfast. I don't add coriander while making pesarattu. Will try adding next time. 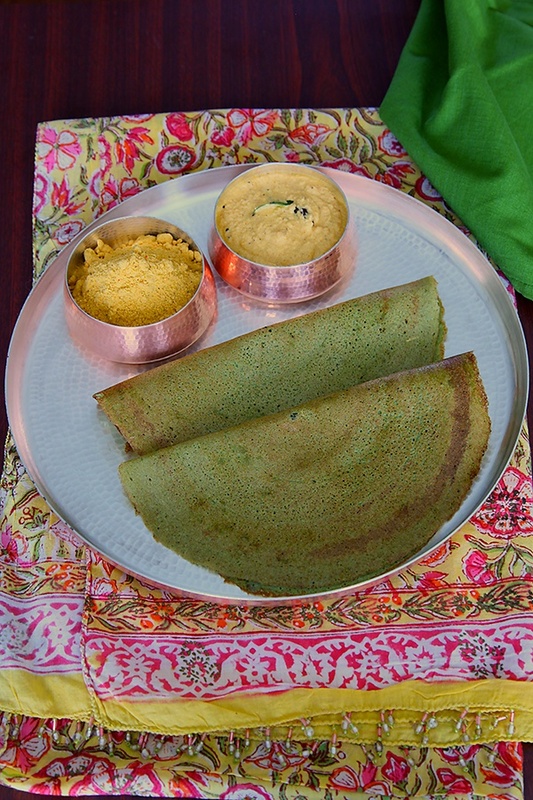 If its Iron, please suggest the thickness required, because many types are available in market and I am confused..
Lisha- Adding corainder leaves gives a nice colour and flavour to this dosa. Roopa- Definitely cast iron. Get the thickest ones possible and season it well. You will have the best dosas! Ramya- Great to hear that. Thank you! Monali- Cast iron tavas are available in traditional Indian markets. Turned out crisp and yummy. Thanks for sharing the recipe. Ann- Thank you for your feedback and wishes. Hi Anushruti, I tried this recipe and it turned out brilliant. I cooked the batter in Gowardhan Ghee to get the crisp finish. 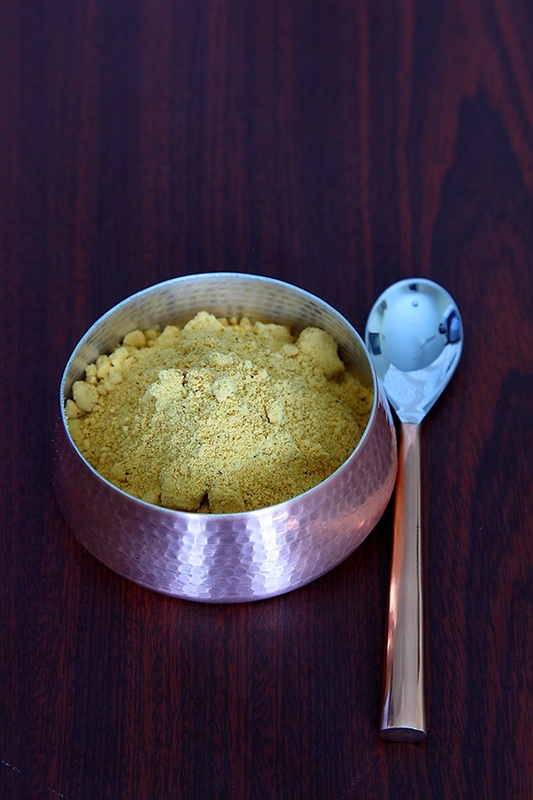 Since a few years my family has been using this particular ghee and I absolutely love the flavour and taste it adds to any dish. I love how you innovate and create new recipes. It is so much fun to play with ingredients and like someone mentioned, you have a lovely kitchen. I want to tell you that this recipe has become our Sunday staple and my family loves it. mrunalini- How nice to hear from you! Ghee can transform any food for sure. Glad you like to use ghee. I have made this recipe multiple times, and yesterday pulled up this page again to see if i'm missing anything, and realize a big blunder I had been making. Somehow instead of Green whole Moong daal, I kept using Green Whole chana daal. And so just wanted to let you know that this blunder also gave amazing dosas.